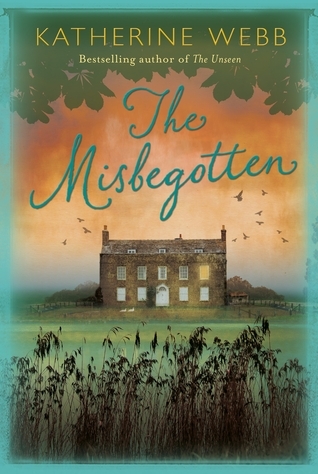 I was captivated by ‘The Misbegotten’, a wonderfully readable, utterly compelling story, set early in the eighteenth century. It is story of dark secrets, terrible losses, devastating lies, of the lives that they affect, and of truths that may be brought to light at a very high price. It is the story of Starling, a founding, a girl-child found walking from the marshes. She who has the good fortune to be found by a good-hearted young woman. Alice took in the child, she gave her a name, she brought her up, and in time she found a place as a servant in the family home. It is the story of Jonathan Alleyn, who loved Alice more than life itself, and who is devastated, completely broken, when Alice disappears. He becomes a recluse, watched over his anxious mother. Starling was told that Alice ran away, but she didn’t believe it. She believed that Jonathan had killed Alice, and that the knowledge of what he had done had left him unhinged. And it is the story of Rachel, a governess, who seized a chance of marriage that she thought would bring her freedom. It didn’t; she found she was trapped. And then fate pitched her into the middle of the Alleyn household, where she was drawn into in the haunting mystery surrounding Alice’s departure. The plot that brings all of these stories together is beautifully and brilliantly constructed. Secrets lead to more secrets, and the narrative becomes more and more compelling. Because I believed in these people, who they were, what their lives had made them, what they said, how they acted. And I cared. I appreciated a wealth of wonderful detail, and that every detail was significant. I appreciated lovely storytelling, full of rich descriptions that brought times and places completely to life. I was pulled in, I was pulled back and forth across twenty or so years, early in the nineteenth century, and I just couldn’t let go. The Misbegotten is a big and heavy book, but it didn’t feel like a big and heavy book. I read quickly because I so wanted to know – at first I was mystified, in time I put together a few ideas, but I didn’t work out everything until the end. As I read I saw the influence of some of the nineteenth century’s most beloved authors. I saw Rachel walk the same streets and visit the same places as Jane Austen’s characters, in the city of Bath. I caught echoes of Emily Bronte in the relationship between Alice and Jonathan. And the plotting made me think of Wilkie Collins. But don’t think this is a pastiche. The Misbegotten has so much more than those influences, and it stands on its own merits. It speaks clearly of the inferior position of women in society, of the horrors of war, and it touches on themes that I don’t think would be found in any novel of its period. It’s such a cliché, but I have to say that this is the perfect book to curl up with on a gloomy autumn evening. Because it is! And I also have to say that if you plan to read ‘The Misbegotten’ you shouldn’t read too much about it before you start to read, because the details of characters, relationships and situations emerge so beautifully that it would be a pity not to come to as much of the book as you can without foreknowledge. The story did rather lurch into melodrama at the end, but I didn’t mind. I know that not everybody likes it but I like a little melodrama from time to time. And the plot did resolve itself very nicely. I appreciated that the knots were tied, but they weren’t tied too tightly or to neatly. There was one lose thread, that night or might not have been attended to, and it was rather nice to be left with that to ponder. I’m sorry to have come to the end of The Misbegotten, but I am very pleased to have found a contemporary author with a backlist to explore. I’m so glad you said that about reading this without reading too much about it first! The pleasure of being surprised by something we read doesn’t happen often enough. I’m looking forward to this, even more because of the way you told us about it. This won’t be available in the US until November – I’ll definitely be looking for it. I just took a quick glance at Amazon, to see the publication information, but following your advice, I didn’t want to read too much about the plot or any reviews. Sounds like a lovely autumn-by-the-fire book – and it *is* nice to find a contemporary author you like! As soon as I read your first paragraph I thought this sounded like my sort of book and the rest of your review has convinced me. One to add to my autumn reading list, I think! Ugh! ok so it “reads” much like The THirteenth Tale which I loved .. so this goes on ye ol’ wish list! Great Review! Thanks! This sounds really good and your enjoyment in the book really comes over very strongly which is such a great recommendation. I will definitely make a note of this one. I definitely want to give this one a try! It sounds like a book that I would definitely enjoy and your review made me want to read it even more. Thanks!